“Swaraj is my birthright, and I shall have it” was first said by Lokmanya Tilak in Belgaum in 1916. Bal Gangadhar Tilak or Lokmanya Tilak born as Keshav Gangadhar Tilak founded the Home Rule League in April 1916 at Belgaum, now Belagavi. The Tilak’s League who was to work in Maharashtra (including Bombay city), Karnataka, the Central Provinces, and Berar. Tilak’s League was organised into six branches. Tilak visited Shivanand theatre at Belgaum on June 14, 1916. When he was released from jail, a meeting was conducted at the theatre. Eminent freedom fighters from Belgaum district Shri Gangadharrao Deshpande Lion of Karnataka and Shri Govindrao Yalagi accompanied Tilak. 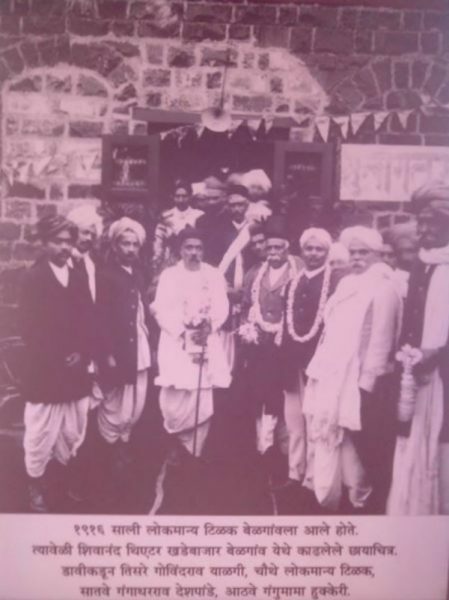 This was his second and last visit to Belgaum, earlier he had visited Belgaum in the year 1905 inaugurate the Ganapati Festival at Zenda Chowk, which was initiated by Shri Gangadharrao Deshpande and Shri Govindrao Yalagi. Bombay State Political Conference was held in 1916 at Belgaum and he announced his famous slogan “Swaraj is my birthright, and I shall have it” at this conference. Tilak met Mahatma Gandhi for the first time at this conference. Gangadharrao Deshpande was the Secretary of the Reception Committee. Gangadharrao Deshpande was chosen as one of the Vice Presidents of Home Rule League. Some people wrote a letter to Gandhi and requested him not to attend the conference. But Gandhi wrote a letter in reply and told “Nothing but only death can prevent me from going to Belgaum and attending the Conference”.